A blog and resource by a practicing lawyer in Pennsylvania about Elder Law, Estate/Trust Planning & Administration, Fiduciaries, PA Orphans' Court Litigation, and Senior Mediation Services. 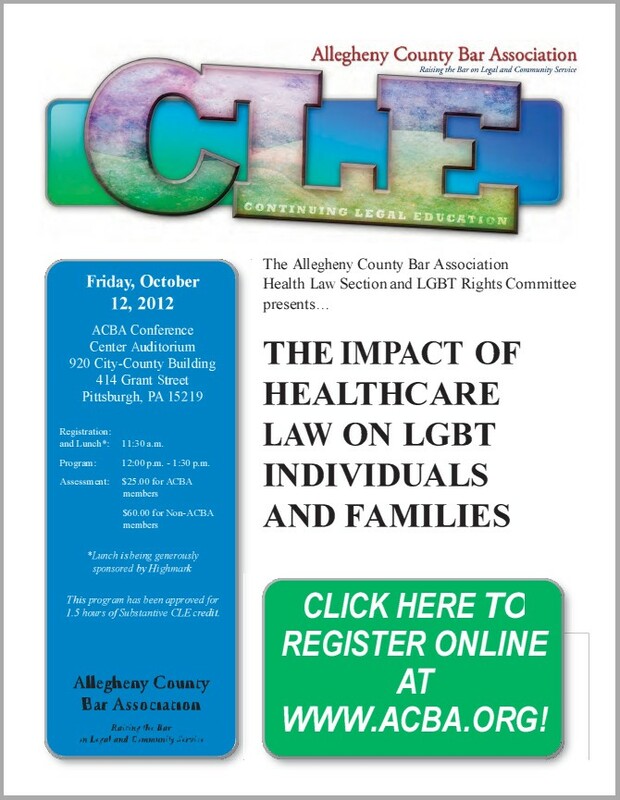 Impact of Health Law on LGBT Individuals and Families is the title and subject of a 1½ hour continuing legal education program to be held on Friday, October 12, 2012, as sponsored by the Allegheny County Bar Association, through its Health Law Section, in partnership with its LGBT Rights Committee, which was created in March, 2012. Highmark underwrites the program. A panel of experts representing perspectives from across the industry will present an assessment of the new federal healthcare reform law, FMLA [Family and Medical Leave Act], Advance Directives and Health Care Decision Making, and Hospital Visitation and Consent to Treatment for Minors and will discuss the impact of these laws on the LGBT community. Much of this information will also apply to other non-traditional families. This program will serve healthcare providers and their attorneys who need to be aware of the unique characteristics and challenges of LGBT individuals and families, as well as other nontraditional families, in the healthcare setting. LGBT (lesbian, gay, bisexual, and transgender) folks, or individuals in "non-traditional" families, have drawn greater attention during the past twenty years. In the healthcare delivery and decision-making settings, their personal expectations and interpersonal relationships often become ignored or overridden by application of statutes that grant "default" rights to others, defined by bloodline or traditional legal relationships. Awareness, forethought, and implementation are recommended for LGBT folks, their families, and their attorneys to overcome such hurdles. Absent attention, planning, and documentation, an unwanted, unnecessary crisis might result. It’s at the heart of the American dream: the belief that if you work hard, if you're responsible in your community, if you take care of your family, then that’s how you should be judged. Not by what you look like, not by how you worship, not by where you come from, and not by whom you love. Of critical importance for LGBT advocates is the CMS position on medical decision-making, allowing LGBT couples greater flexibility to make care decisions for their loved ones. The program will be held on Friday, October 12, 2012, in the ACBA Conference Center Auditorium, 920 City-County Bldg., 414 Grant Street, Pittsburgh PA, with registration and lunch from 11:30 AM – 12:00 Noon, followed by the presentations until 1:30 PM. For ACBA members, the cost is $25, and for others, $60. Registrations can be made online through the ACBA. To access the home page of (and many other postings on) the PA Elder, Estate & Fiduciary Law Blog, click here, or click the title bar & description at the top of this page. UPDATES at the end of postings add more current related material; and LABELS (listed below) characterize posts by subject matter. Search this Blog's postings using Google's Blogspot through the "Search Blog" bar to the far upper left, above the title bar. Or search this Blog's content through FeedBlitz & Google here (recommended method). Or search this Blog's content & sidebar links through Google's "Search" box below. AA: Wall Street Journal's "Wealth Blog"
AZ: "Estate Planning & Tax Law Blog"
CA: "The Tax Lady Blog"
CT: "Connecticut Elder Law Blog"
FL: "Florida Estate Planning Lawyer Blog"
FL: "Florida Probate Litigation Blog"
GA: "Georgia Wills, Trusts, Probate & Estate Planning Blog"
IA: "Wealth & Estate Planning Blog"
IL: "Death & Taxes Blog"
MA: "Estate Planning & Elder Law Blog"
NC: "North Carolina Estate Planning Blog"
NJ: "New Jersey Estate Planning & Elder Law Blog"
NY: "New York Probate Litigation Blog"
NY: "New York Trusts & Litigation Blog"
OH: "Ohio Estate Planning, Probate & Trust Law Blog"
OH: "Ohio Trust & Estate Blog"
PA: "Marshall Elder & Estate Planning Blog"
PA: "PA Estate & Trust Cybrary"
WV: "Aging & Law in West Virginia"
Disciplinary Board of the PA S. Ct. This list of PA Registers of Wills websites, by county, was compiled by Daniel B. Evans, Esq., of Philadelphia, PA. His complete online list of Registers of Wills includes addresses and links for fee schedules & forms, where posted. Unsolicited information communicated from a person to the author or to Schiffman, Sheridan & Brown, P.C., when an attorney-client relationship does not yet exist by mutual agreement, is not confidential or privileged. Also, such contact will not create a conflict of interest or bar representation of another. Information on this Blog is provided for educational purposes. Nothing on this Blog shall be considered legal advice or formal opinions. No reader is justified in relying upon the contents of this Blog, or upon any links contained in it, regarding personal matters. The author disclaims any liability related to a reader's unilateral use of such information. If a reader requires legal advice or services, contact a qualified attorney licensed in the appropriate jurisdictions or forums to provide personal, confidential advice or representation. The author is licensed to practice law in the Commonwealth of Pennsylvania and before some federal courts & agencies. Any opinions expressed in this Blog are solely those of the author, and not those of Widener University School of Law, of Schiffman, Sheridan & Brown, P.C., or of any other organization with which the author is associated. This Blog's presentation and original material are Copyright © 2006-2018 by Neil E. Hendershot, with "All Rights Reserved". "For it is in giving that we receive."